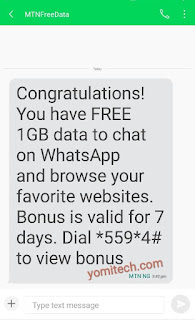 MTN is currently giving out free 1GB data to its subscribers to chat on WhatsApp and browse their favourite websites. 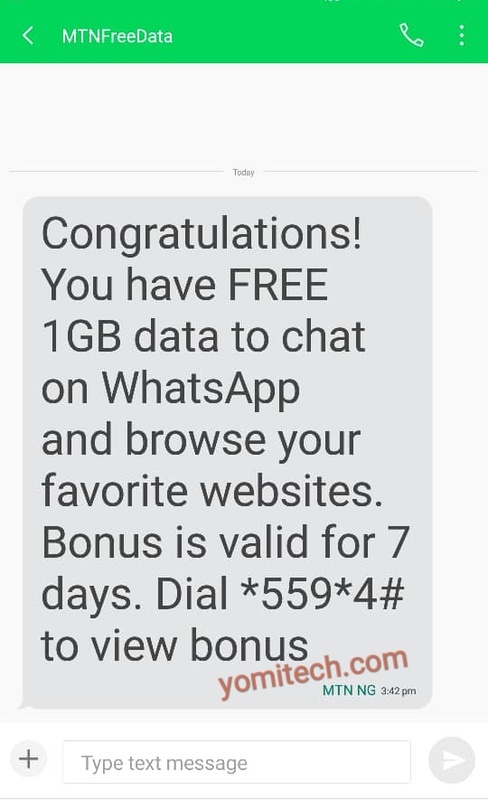 The free bonus data is valid for 7 days. The free data is pretty much random as MTN didn't give any reason behind it. The data works on all internet enabled devices and it powers all apps. Unfortunately, this free data is only for a few selected MTN subscribers. If you are among the few lucky MTN subscribers, then you will receive a text message just like the one below. "Congratulations! You have FREE 1GB data to chat on WhatsApp and browse your favorite websites. Bonus is valid for 7 daysCongratulations! You have FREE 1GB data to chat on WhatsApp and browse your favorite websites. Bonus is valid for 7 days. Dial *559*4# to view bonus"
If you didn't receive the text message then your SIM probably wasn't selected. Note that there is no activation code for this free MTN data but you can still confirm if you got the data by dialing *559*4#.